When I reviewed the BitFenix Ghost, some of you requested we take a look at the Nanoxia Deep Silence 1. Nanoxia isn't selling on American shores yet, but there's been a lot of buzz going around about this case, and Nanoxia has been steadily making inroads towards getting it into our hands. If you couldn't tell from the name, the Deep Silence 1 is designed for quiet, efficient running, and in many ways it looks like exactly the case I requested at the end of my review of the Ghost: same principles, just bigger and better. As it turns out, Nanoxia wanted us to look at the Deep Silence 1 as well. I was initially reluctant as you can't actually buy it in the States yet, but hopefully this review will help change that. While the Deep Silence 1 isn't the grand slam some people make it out to be, it is very close, and demonstrates a real evolution in the way silent cases are designed. So what did this small German firm do with the Deep Silence 1 that makes it so different from other silent cases? A few things, as it turns out. In my experience, cases engineered for silent running can oftentimes be chasing the wrong vectors. They're seldom bad cases, but acoustic padding can't make up for efficient airflow, and having to close off ventilation can actually cause more problems than it solves. It's entirely possible to produce a silent, well-ventilated case, but getting the design right means dodging a veritable minefield of decisions that will threaten to undermine your intended goal. The result, thus far, has been that while cases like the BitFenix Ghost and Corsair Obsidian 550D aren't necessarily bad, with our testbed they've had to expend more effort on trying to smother the noise generated by high fan speeds rather than keeping the components cooler in the first place. Users interested in building a system designed to run quietly will have less trouble (they'll be more apt to use quieter-running parts), but the underlying issue persists, so the question is...was Nanoxia able to do the unthinkable and balance the equation? Dimensions 20.35" x 8.66" x 20.94"
Even just unboxing it, what struck me the most about the Deep Silence 1 is how heavy it is, and that was my first clue that it might be a bit better at its job than some of the other silent cases I've tested. 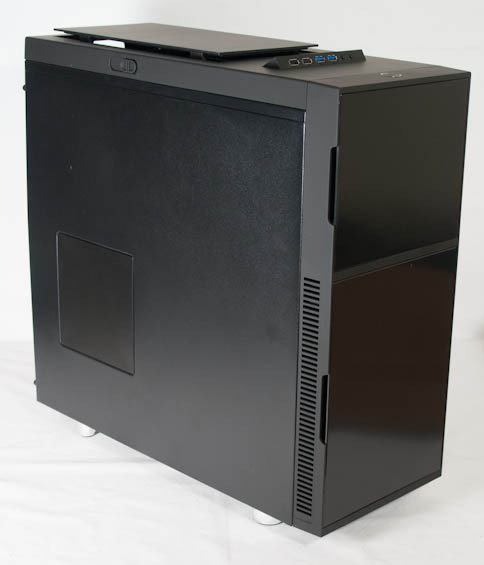 It's appreciably heavier than both the BitFenix Ghost and the Corsair Obsidian 550D due to the use of both the acoustic padding and, frankly, a heavy steel frame. This is not a cheaply built case, and the thicker materials used in its construction should go a long way towards containing noise. A lot of people seeking silence prefer small cases. Not to ignore those who love giant cases and silence, but this case is definitely way too big for me. Sure, but at what point? I think the MSRP depends a lot, on where they manufacture. If (I doubt it) the case is made in Germany, then the added cost of exporting into the States will probably make the prices slightly higher. If they're producing in China (or anywhere else in East-Asia), then they can export directly from there into the US and should be able to match the Euro prices.